While winter is still flirting with us here in zone 7, many of our friends are already hunkered down throughout the country to weather out winter storms. Though I love the simple beauty of winter, I hate that freezing feeling. You know the one, where you can’t seem to ever get warm. The one that no matter how many layers of socks you put on, you still have toecicles. It’s that down-in-your-bones-cold feeling that no heap of blankets can seem to remedy. If you’re having trouble staying warm from the inside out, then it’s time to brew some delicious hot tea. There’s no quicker cure for this kind of coldness, than a steaming cup of herbal tea to lift your spirits, warm your bones and relax your mind. For an added benefit, try mixing medicinal herbs into your brew to ward off those worrisome winter sniffles. Here’s a great recipe from our Marketing Director, Caroline, who usually uses her cats as a “mew”-lectric blanket, but when they’re not enough, she turns to a hot cup of herbal tea from her garden. We’ve had a relatively mild winter here in the Richmond, VA area this year, so when we experienced our first cold day, it was a shock. I got home after a long commute in the cold, and I just couldn’t leave the January chill at the door. I turned the heat up and donned a sweater but still wasn’t satisfied with the temperature. After a quick survey of the kitchen, I realized that it must be time to grocery shop, because I was out of herbal tea. Instead of chattering any longer, I realized that because of the unseasonably warm winter we’d had until this point, I still had a few hardy herbs left in my gardens outside and some indoor potted herb gardens thriving in my kitchen. 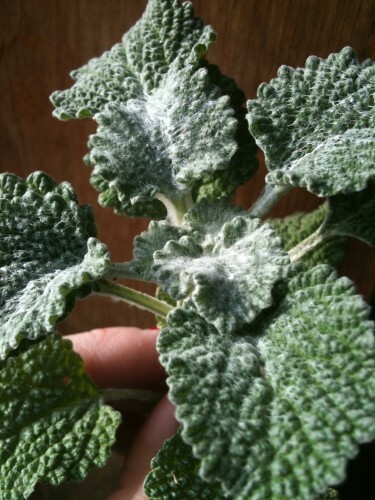 Younger Horehound leaves are covered in a protective fuzz that they shed as they grow bigger. 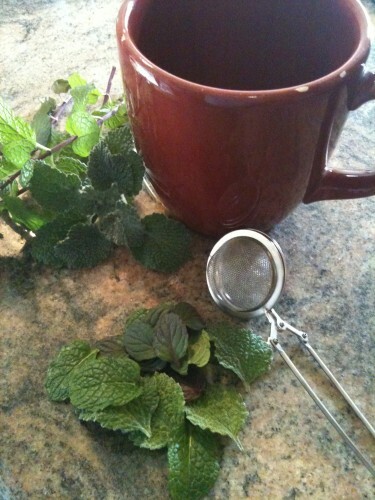 I gathered a handful of Horehound, an old fashioned medicinal herb, related to mint that acts as a soothing expectorant. Though not approved by the FDA you can find Horehound in many candies, cold remedies and lozenges, and makes a wonderful tea. (As with all medicinal herbs though, you should consult your doctor or herbalist if taking other medications and it shouldn’t be taken in large doses, especially by people with heart conditions or who may be pregnant because it may affect your blood pressure or existing heart conditions.) I think it’s a beautiful plant in the garden, with its fuzzy, textured leaves and was excited to try it in tea. I found it to be slightly on the bitter side, so next time I’m adding more Mint and maybe even some Stevia to sweeten it up! 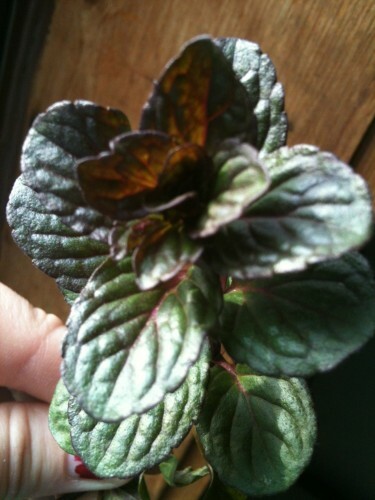 Chocolate Mint is a beautiful addition to your kitchen garden. I also picked a few dark sprigs of Chocolate Mint and some large, bright green leaves of Kentucky Colonel Mint for flavor. 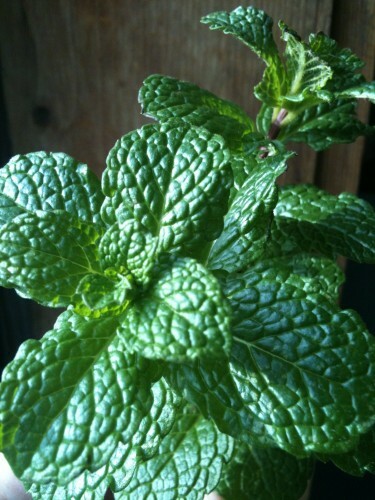 Mint has always been one of my favorite plants- it’s easy to grow, easy to use, and each variety has its own charm. The smooth, dramatic leaves of the Chocolate Mint and the brilliantly green texture of the Kentucky Colonel Mint look as great in an herb bouquet as they taste in a tea! These two varieties are a unique twist on the standard Peppermint flavor. Kentucky Colonel has a bold, spicy spearmint taste that works well in summer drinks and salads. Chocolate Mint has a smoother, more subdued flavor, warmer than some of the other varieties, and tastes great in desserts. Both of these culinary herbs are perfect for making tea, as Mint is a great digestive aid and its strong mentholated aroma allows you to breathe more easily. Kentucky Colonel Mint is great for more than just Mint Juleps! Being too impatient to dry my herbs, I washed and chopped them and then packed them into a small tea infused. Just add hot water and let the leaves steep for a bit! 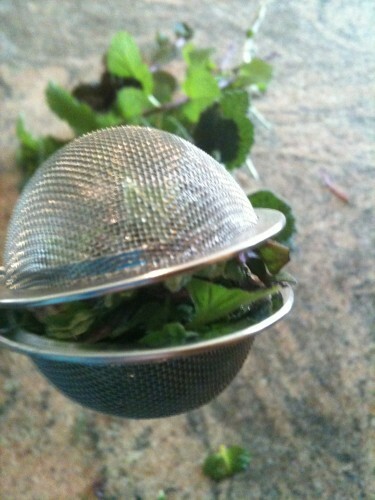 You can also dry your herbs in advance for more of a traditional tea. You can also use cheesecloth to make a small pouch for infusing. Consider tisanes (herbs for making tea or herbal infusions) when you’re planning your next garden. We all love teas with more floral flavors, like Chamomile and Lavender, but don’t forget that many culinary herbs make a great tea, too. Some other unlikely candidates for a healthy, flavorful tea to warm your bones are Lemon Grass, Rosemary, Basil and Lemon Thyme. Try mixing different variations of your favorite culinary herbs and discover a delicious new way to use your garden! 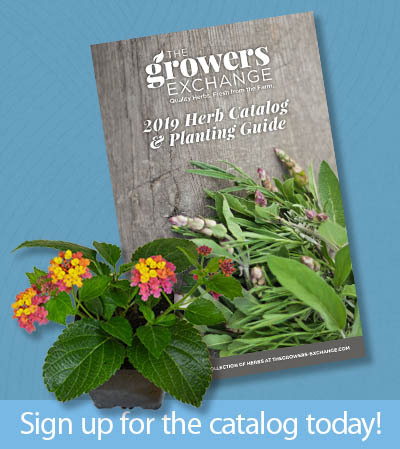 Want to get a start on your herb garden during these cold winter months? Try one of our Potted Herb Garden Kits, like our Time For Tea Gift Set and we’ll give you everything you need, from soil to saucer, to grow your own tea garden.